I debated on posting this item on our website, because I did not want to defend anyone on this issue or the image of our TV show stars. This was a fun (gay) magazine issued by Jim Pepper (featured on front cover as Dr. Smith) from the Next Magazine Publication in New York City. 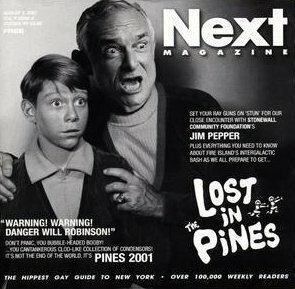 The magazine featured Billy Mumy and Jonathan Harris and titled, "Lost in Pines!" This magazine is for the fan that needs and wants everything for their collection.